Found in Translation: Little Thing explores eeBoo’s studio! eeBoo is a home-grown company with international reach. How international? Try China! 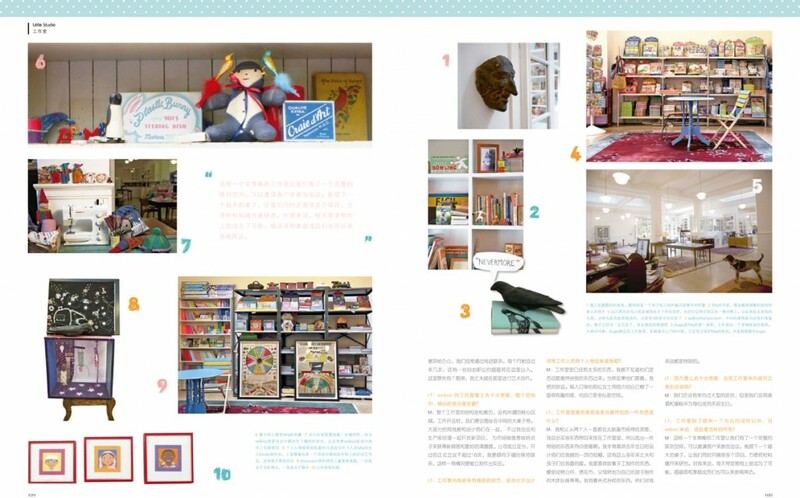 This month Little Thing, a Chinese style magazine that collects and features especially beautiful items, sought out eeBoo founder Mia Galison to talk about our studio space. In the ensuing interview, Mia talks candidly about the structure of eeBoo, our 19th century ballroom studio space (come and visit us!) on 74th and Amsterdam in New York City, and various sources of inspiration. A translation for non-Chinese speakers is included at the bottom of this post! Little Thing is full of stunning photography and boasts an aesthetic that is a perfect mix of vintage and modern. Their motto is “we collect beautiful things!” eeBoo makes beautiful things, so it’s no surprise that we’ve crossed paths! As Mia says in the interview, eeBoo always strives to ”make art in a real and emotional way” – and we’re glad to share that our studio space reflects that sentiment in style, design and thought! You can explore our studio here too! 1) eeBoo’s products are so colorful and have such fun childlike qualities. However, the studio was converted from an old building (a ballroom no less!). Why did you choose such a location to establish the eeBoo studio? I started eeBoo about 15 years ago when I had a one year old son and newborn twins. My husband is a painter and worked at home and I wanted and needed to be home too. We rented an apartment in the basement of our building and worked there for many years running up and down to work and to be with our children. Our phone lines ran out the window from our home to our office so if our children needed us they could stomp on the floor, over where my desk was, and I would pick up the phone. The most important thing for me was not to give up my life with my family for work so when the time came that we ran out of room in the basement it was of utmost importance that I find an office near my home. We live in a residential neighborhood and there are very few places to rent for work. The space we are now in was originally a ballroom for a residential hotel at the turn of the century. When we found it listed for rent it was being used as a storage space and all of the windows and skylights had been bricked over, the ceiling had been dropped to enclose air conditioning and the space had been broken down into over ten little rooms. Even the landlord had no idea of the potential but we saw something very special hidden beneath years of decay and garbage. Ideally the studio is located near to where my children are at school and a few blocks from my parents. 2) Could you please simply go over the divisions of the space and their functions? When we first moved in the space was overwhelmingly large. I had the idea to buy Art Deco Chinese design rugs and use them to differentiate the different departments. We have a design department where we work on developing our products, a production department where we track our manufacturing, communicate with factories and source new potential manufacturing partners, there is a lady who enters orders as they come in from stores and sales representative, an operations manager who handles our accounts and oversees our computers and banking , and does all the office management, there is a lady who does customer service who speaks all day answering questions and helping customers and who does outreach to find new customers and press. We also have two assistants who help out with where needed. The Vice president of eeBoo who is the primary sales manager works offsite in an office in Pittsburgh where she relocated a few years ago. We speak frequently on the phone and she comes to the office a few times a month. Freelance illustrators come and go. My husband does his art down below in a studio that was once the kitchens for the ballroom. 3) The studio looks very open and spacious. In this large space, where is the heart of the studio? The studio is very fluid and does not really have a heart. 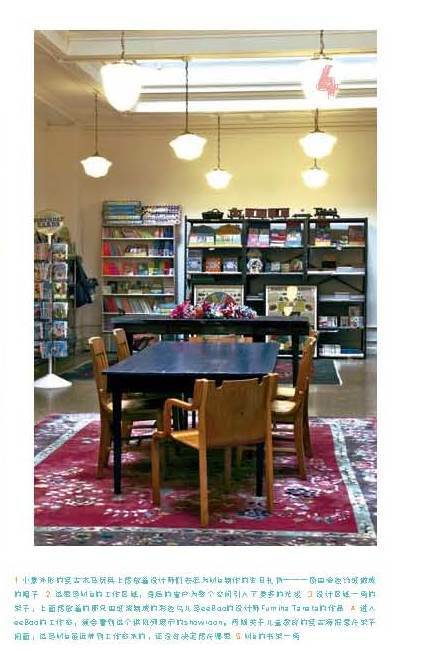 Loosely we sit in a circle with large tables in the center of the space where we work on projects and have meetings. I spend a lot of time over with the designers but I also work closely with the production manager sourcing new projects and the sales and marketing staff brainstorming about new ways to find new customers and better satisfy our existing ones. We have had no more than 10 formal meetings in the life of the company. I prefer to keep a running dialog going so we can react to situations as they come up. 4) There are so many interesting parts and places within the studio. Are staff members (like the designers, etc) allowed to bring in their personal items to decorate the space? There is so much stuff in the studio already I don’t know if anyone really wants to bring in anything else but of course they are welcome too. The lady that enters orders has made herself a a funny tissue paper covered wall to give herself more privacy. 5) What’s one of the most meaningful or special object in the studio? My husband and I go to flea markets all year long to look for inspiration and I am always buying things to bring back to show at the studio–so it is too difficult to choose one special object. I really love a crepe paper hat that the designers made me for my birthday last year and I have many original drawings that my husband and children have made for me over the years. My favorite things to collect are pieces that were made by hand–stuffed animals, embroidered cloth, carved wooden toys that parents have made for their children. I have many of this kind of objects and they are all special to me. 6) Because of how spacious the space is, do you ever hold any parties or events there? We have not had any big parties but we do celebrate everyone birthday with fancy alchoholic drinks and cakes–luckily it always seems to be some ones birthday! 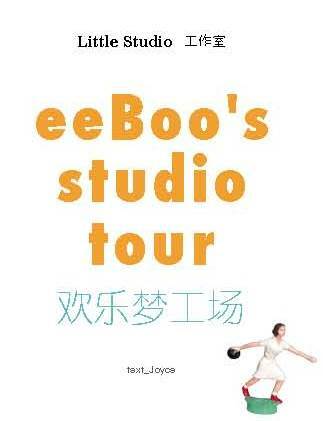 7) Besides providing quarters for a functional office, what other purposes does the studio serve for eeBoo? One of the great appeals of this beautiful space was that we could have a full showroom and invite our customers here for meetings. The luxury of having big tables enables us to work on lots of projects at once and lets us spread out materials for review. It is also possible for me to bring my dogs here everyday and have illustrators and family members come and visit. 8) We believe eeBoo will continue to develop and grow. Do you have other things/requirements you would like of the studio? I’m not sure of what you mean by this question but I’ll tell you what my immediate plans for expansion are. We have just started to develop more art supplies and craft kits. This is a direction that I think eeBoo is uniquely qualified to succeed in. We are blessed with such a super talented and creative staff who all understand and appreciate the making of art in a real and emotional way.